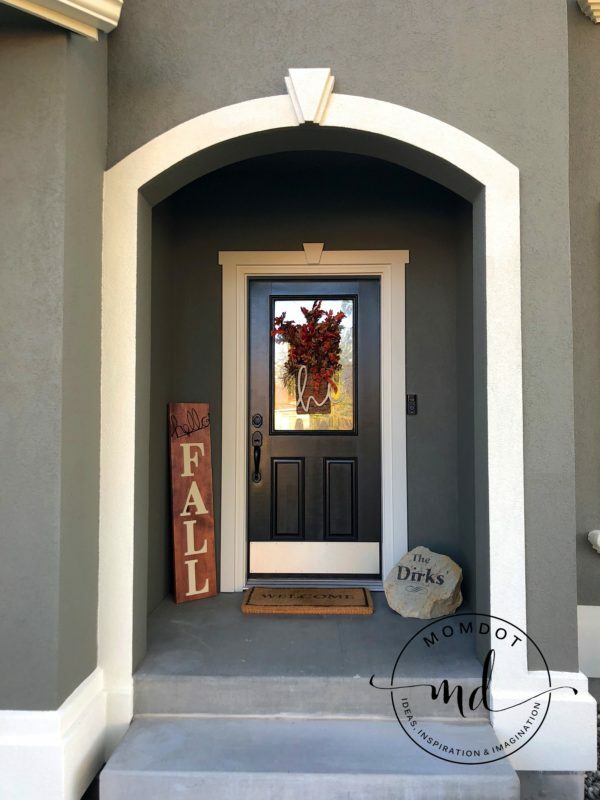 We recently had the exterior of our home painted. It was a project that I looked forward to in theory, but when the time came to choose the paint color, I was a nervous wreck. It’s a very scary thing to choose a paint color for an entire house. 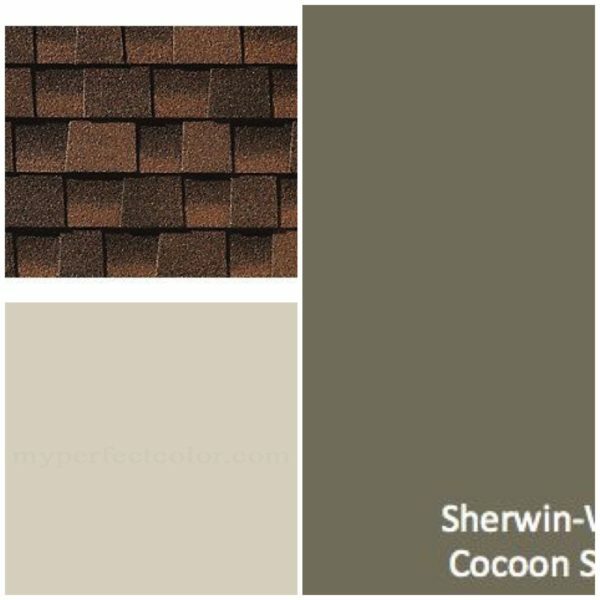 Had the shingles been a black or gray, the choice wouldn’t have been so scary. But they’re a very bright red-brown color, which really limits the options and made it really difficult to feel secure in my choice. Ultimately, we chose Sherwin Williams Cocoon (SW 6173) for the main color, and Sherwin Williams Grecian Ivory (SW 7541) for the trim. I could not be more thrilled with how it turned out. With the transformation of our front entry, I wanted to update some of my decor. As I was walking through the Clearance section at Target, I happened upon a Hello picture hanger, and my imagination ignited. I hurried from Target, straight to Home Depot, and got right to work that afternoon. Begin by removing any UPC stickers, and dusting off your board and wood letters. 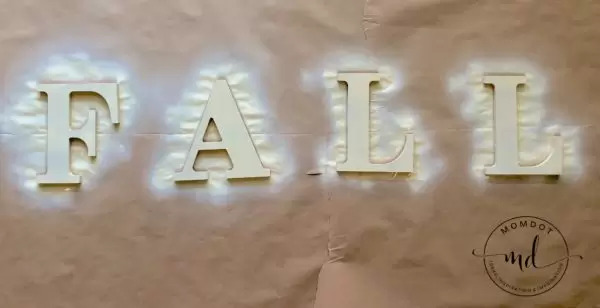 Since the spray paint takes the longest time to fully dry, and because you’ll want to do more than one coat, begin by spraying your first coat of spray paint on your letters. Allow to dry before applying a second coat. Using latex gloves to protect your skin, dip the rag directly into the stain and drag across the wood in long strokes, going with the grain. The look I wanted was a very light stain, however you could use as many coats as you’d like to get the look you envision for your own sign. Whether you do just one coat, or many, allow to fully dry. Because of the light application, mine took less than 20 minutes. As you wait for your stain to dry, and if your first coat is dry on your letters, apply the second coat of spray paint to your letters. 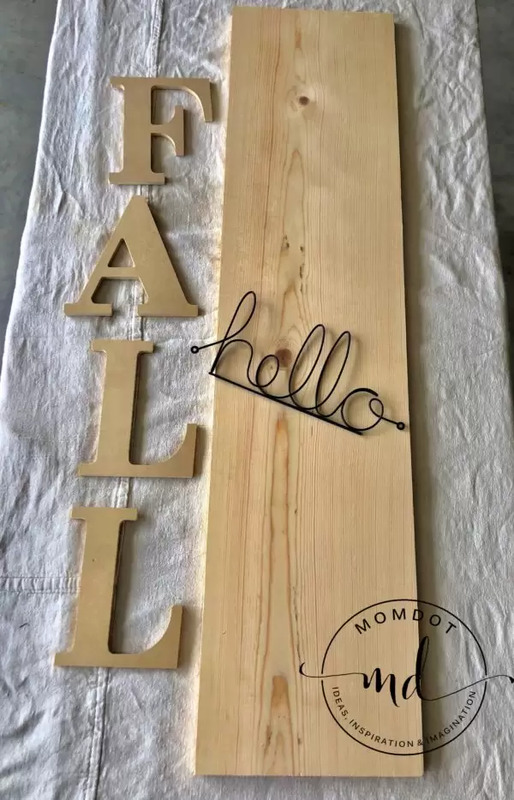 Once my stained board was dry, I attached my metal Hello sign. I’ve seen a few different signs that would look adorable, all of which were in cursive. I love the look of cursive next to block letters! “Hello,” “Hi,” “Hola,” and “Welcome” could all look fantastic. You could also put your F-A-L-L letters on top of a cursive LOVE sign. So many possibilities for different entry sign looks! Leaving approximately an inch and a half (1.5″) from the top of the board, I angled my Hello and secured it with some black screws I had saved from a different project. Once your F-A-L-L letters are dry, lay them out on your board to begin measuring for permanent placement. Starting from the bottom, I measured an inch and a half (1.5″) between the bottom of the board and the bottom of the L. Once the measurement was precise, I’d place the square directly under the letter, to keep it perfectly level and in the place I wanted it secured with glue. Using your ruler or measuring tape, you could either mark the center of each letter and the center of the board, or you could measure each side of the letter against either side of the board to ensure the letter is centered on the board. Once the letter placement is centered on the board, make sure you remember the measurement of one side for easier placement of the next step. For this tutorial example, we’ll use the measurement of the L, which is 2 3/8″ from the side of the board. Carefully lift the letter from the board, making sure the square (if you choose to use one) does not move. That way, you know the bottom edge is in the correct place, and you also ensure that the letter is level and straight when you place it. As you begin to place the letter, measure that 2 3/8″ (this will not be the measurement for all of them, just this example) from the edge of the board for the placement of the side of the letter. As you’re placing the letter, it doesn’t have to be exact at the placement point, but you will want to make sure it is exact before moving on to the next letter. You have room to wiggle the letter and nudge it around a bit, but only if you placed the letter as close as possible at placement, because you don’t want to smear the glue from under the letter. Repeat all steps for each letter, being careful not to bump the previously glued letters. If you do happen to bump a letter, simply take the time to measure and center it again, since you’ll have time before the glue is fully set. Start to finish, it took me less than an hour to get to this point, and then another hour and a half for the wood glue to dry. Welcoming my kids home from school, and friends to our home. While I love the new color of our home SO much, I do think my new sign enhances the entry beautifully and welcomes guests in glorious fashion. Welcome to my home, friends! « Nutter Butter Mummies – Frightfully Easy To Make!